Sign to Talk: Nouns presents 150 photographic flashcards designed to shape verbal language specifically for individuals with autism and other developmental challenges. These cards are ideal for their crisp, clear images and their Kaufman Speech Praxis word shell breakdowns which help to shape articulation skills on the back of each card. 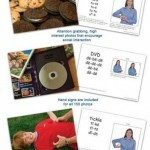 The set offers myriad teaching opportunities as each card also depicts a photo of a person demonstrating the sign in ASL and a description of the hand shapes for each target item. Use this deck for home or school, to teach sign manding, or for the child-appropriate images that aid in any language acquisition program. This week only, save 15% on the Sign to Talk: Nouns by entering the Promo Code BLOGSTN at checkout. Written by: Different Roads to Learning on January 31, 2012. This entry was posted in ABA, autism, autistic spectrum disorder, Difflearn Promo Code, Pick of the Week, Products, Sale, Speech & Language and tagged ABA, Applied Behavior Analysis, autism, autism education, conversational skills, developmental delays, developmental disabilities, generalization of skills, language development, learning, teaching tools by Different Roads to Learning. Bookmark the permalink.